Tantor Media is releasing another new limited time FREE MP3 audiobook download. Despite what it looks like on the cover (apparently Sherlock Holmes had a Macbook Air) The Memoirs Of Sherlock Holmes is an all original, un-remixed, collection of Sherlock Holmes stories, first collected in 1894. You will need to have an account with Tantor Media, and to login to it. Start by clicking HERE. Accounts are free and do not require a credit card. The free audiobook should be available through the end of June 2011. I know some folks have had difficulty figuring out how to either “log in” or “create an account.” You must have an account and be logged in to get to the download. It is a two step process as illustrated below. As usual there was a bit of trouble the first couple of times I downloaded the zipped file, but it now works and downloads. You will, of course, also need to unzip the MP3s once the download completes. 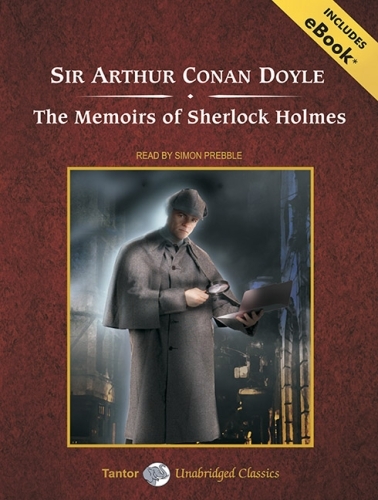 The Memoirs Of Sherlock Holmes are overshadowed by the event with which they close—the meeting of the great detective and Moriarty, the Napoleon of Crime. When The Final Problem was first published, the struggle between Holmes and his arch nemesis, seemingly to the death, left many readers desolate at the loss of Holmes, but it also led to his immortality as a literary figure. The stories that precede it included two narratives from Holmes himself—on a mutiny at sea and a treasure hunt in a Sussex country house—as well as a meeting with his brilliant brother Mycroft. Stories included: Silver Blaze, The Yellow Face, The Stock-Broker’s Clerk, The ‘Gloria Scott’, The Musgrave Ritual, The Reigate Puzzle, The Crooked Man, The Resident Patient, The Greek Interpreter, The Naval Treaty, and The Final Problem. I should also point out that like most publications of this collection in the USA, over that last 117 years, this collection omits The Adventure Of The Cardboard Box for what Wikipedia indicates are reasons of morality.